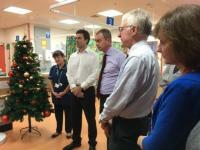 Leading politicians from the Liberal Democrats were left “immensely impressed” after a planned visit to the A&E Department at St Helier Hospital recently. Queen Mary’s Hospital for Children is looking particularly festive this Christmas thanks to a team of Santa’s little helpers who decorated the hospital from top-to-toe. An Epsom-based charity has once again pulled out all the stops to help spread some Christmas cheer to patients going home alone from Epsom and St Helier hospitals over the festive period. Christmas has come early for patients and staff at Epsom Hospital thanks to the delivery of a state-of-the-art ultrasound machine that will be used to help diagnose complex medical problems, such as strokes. Epsom and St Helier hospitals are giving people the chance to write a special message to loved ones on their Christmas memorial trees this year.